I DIDN’T enjoy the 2014 Grand Finals and the reasons were simple. One of my teams was in and one wasn’t. East Perth went into the WAFL Grand Final as favourites. I supported them for more than 50 years but this year I couldn’t. It’s because of the alignment with the West Coast Eagles. The Royals just didn’t seem like my team anymore. Half the players who took to the field in the Grand Final were in black and blue because they were on the West Coast list. East Perth won premierships in 2000 and 2001 while in an alignment with the Eagles but this year it was different. Under the old arrangement only players recruited from outside of WA played with the aligned club. This year’s GF team included Dom Sheed and Callum Sinclair from Subiaco, Jacob Brennan from East Fremantle, Blayne Wilson and Adam Carter (South Fremantle), Patrick McGinnity and Josh Hill (Claremont) and Brant Colledge and Fraser McInnes (Perth). They weren’t the reason the Royals were good in 2014. If the inclusion of AFL listed players was enough to make a WAFL team good then Fremantle’s aligned club Peel would be good too – probably better because Fremantle were better than West Coast in 2014. Peel finished second last. East Perth players like Craig Wulff, Steven Payne, Brendan Lee, Paul Johnson, Freddie Clutterbuck, Dean Cadwallader and Josh Smith made East Perth good but to me it just didn’t seem right. When I watched them I just didn’t care – it seemed my club had been given away. In the Grand Final Subiaco played as committed team. The last time we had a full alignment in the WAFL (1999) Fremantle’s team South Fremantle went into the big one as favourites only to be beaten by West Perth who appeared to have more spirit. I watched the game on TV quietly hoping Subi would win. I’ve barely missed being at Subiaco Oval for the WAFL GF in 30 years. I love AFL Grand Final day. I was at the MCG to see the game live in 1988, 2007, 2010 (the draw), 2011 and 2013. Flights and accommodation were booked early in 2014, not in anticipation of another Fremantle appearance but in hope. The Dockers never gained momentum in 2014. Eight successive wins as hot favourites told us little and by finals time key players were absent and the team didn’t quite have what it had in 2013. I didn’t have tickets to the Grand Final but enjoyed being in Melbourne. Sam Pang made me giggle as usual at the Footy Almanac lunch at the impressive Royal Melbourne Hotel. 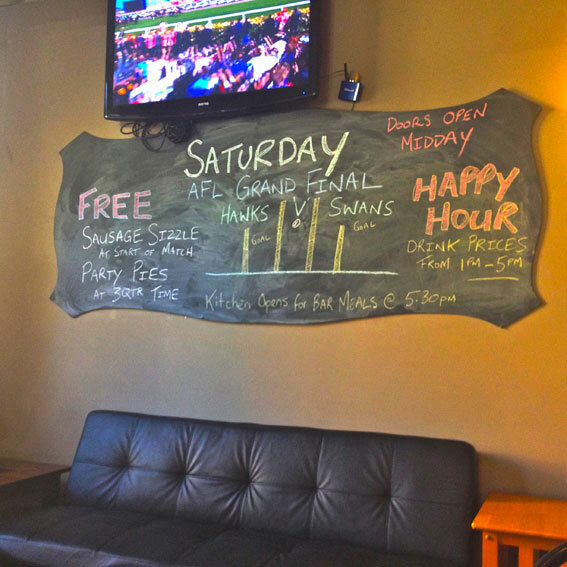 On Saturday we found ourselves in the best seats in the house at the Royal Standard Hotel in North Melbourne. Our Melbourne-based friend had asked around and been told there would be about 20 people at the pub and there would be party pies. We were in. It was even more extravagant – free sausage sizzle before the game! Happy hour drink prices! The crowd might have crept closer to 30. It was perfect. The Hawks were incredible. But somehow the game washed over me. The Grand Final as spectacle isn’t my thing these days. My team has been there and I want to get back and win the bloody thing. “At least we made a game of it,” I muttered towards the end. “Who’s we,” said a Hawks fan who’d overheard. “Fremantle,” I said. He didn’t understand, last year’s game was a blur probably. Just another premiership. As I reflected and acknowledged Hawthorn’s kicking skill, high-octane pressure, carefully selected imports and wondered again how we’d managed to pick three (3!) players in the draft before Brad Hill, I felt more strongly than ever that we blew it in 2013. So we better get back for redemption. This entry was posted in Footy and tagged AFL Grand Final 2014, Craig Wulff, East Perth, Fremantle Dockers, Steven Payne, WAFL alignment 2014. Bookmark the permalink. The alignment was not in place when East Perth won in 2002. It was abandoned after the 2001 season.